Here are some questions prospective members often ask. Q. What happens if I can’t make every training season? A. Lifestyle, traffic and many other factors mean not everyone can get to training on time. No dramas. Our early starters will warm the track up for you! Q. Who can join Keilor St-Bernard’s? A. Anyone, from 12 years old up to retired people who have taken up running late in life. Q. Can I transfer from another Athletics Victoria club? A. Yes. As in any sport, Athletics Victoria allows athletes to transfer between clubs. Transfer forms can be found on the AV website. Q. Will I be good enough? A. Good enough for what? Even if you are slow you are good enough to run with us! No-one starts out as an Olympic champion. We have members of all abilities who train and compete in a friendly and supportive environment. Coaching is tailored to your skill and speed level. Q. What if I’m not ready to run races? A. We encourage our members to run races but if you’re not ready, you’re welcome to enjoy training, get the benefits, and decide yourself when you are ready to start racing. It’s up to you. We just provide the support. Q. Can the whole family join and compete? A. Athletics Victoria is one of the few sporting bodies that provide competitions where entire families can take part on the same day and at the same venue. We have many families who enjoy the co-operative atmosphere of our competitions. There are also economies of scale with family memberships, making athletics at Keilor St Bernard’s the ideal sporting endeavour for busy, time-pressed families. Q. Do I have to compete and in every event? A. Some of our members aim for particular events, and others run the ‘calendar’. Specialist athletes, of course, have no choice; such as jumpers and field games participants who have to wait for the summer track and field season. We often find these athletes take part in running events just to keep fit. Essentially, your competition schedule is up to you. Q. Am I covered by insurance at training and competitions? A. 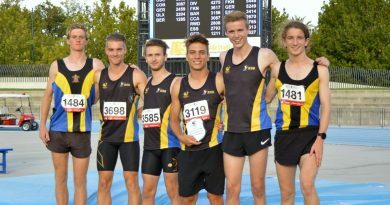 Athletics Victoria memberships include training and competition insurance as part of its annual membership fees.